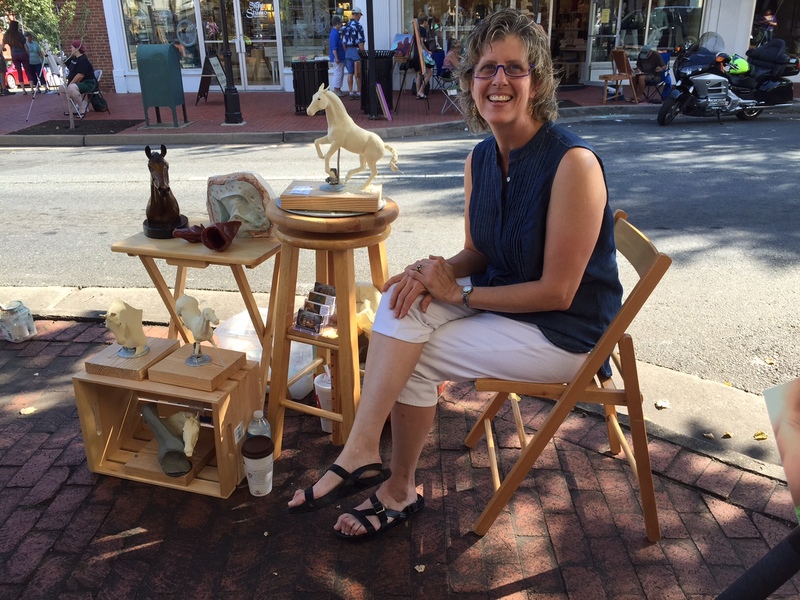 Sharing art for me comes in many forms ranging from outreach efforts such as my artist newsletter, this blog, or posting activities and inspiration on facebook, to teaching, networking with other artists, demonstrations, and even donations. 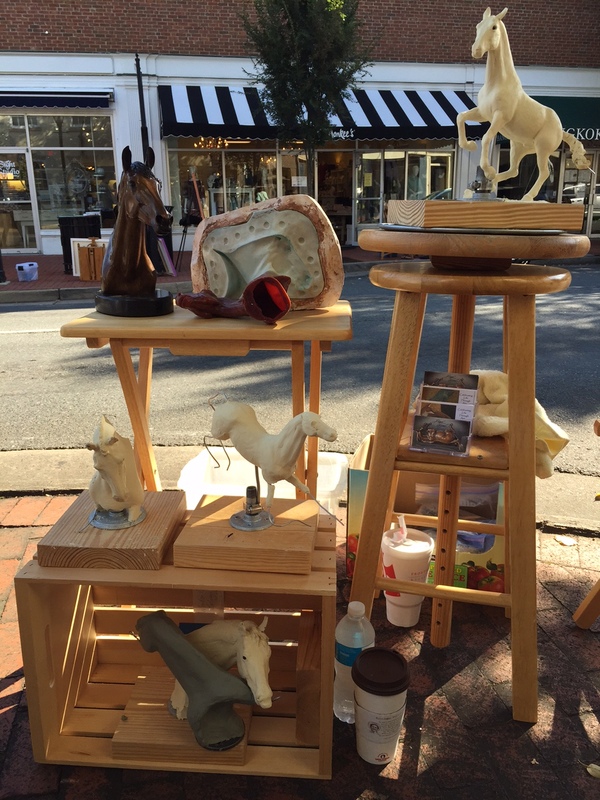 I had the pleasure to participate once again in the Fredericksburg, Virginia “Art Attack”. This event embodies outreach and sharing of 100+ artists with their community as we all descended upon the sidewalks of Fredericksburg to “Do Our Thing” and interact with all of the people! 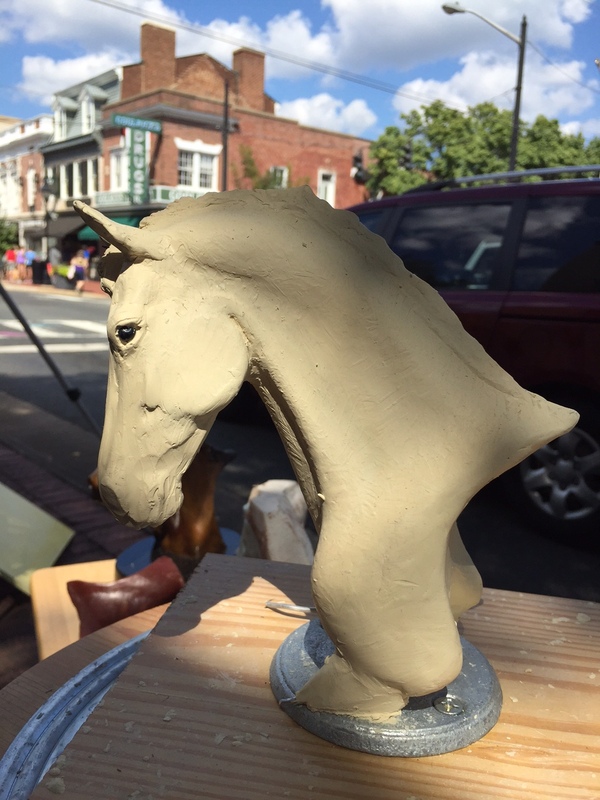 I like to demonstrate my sculpting since it is a bit different and inevitably results in lively interchange vs. simply onlookers and spectators. I work in oil-based clay for my sculpting since it does not dry out, allowing me to continue working it over an extended period of time. I often get questions about “finishing”, “firing”, or “painting” the sculptures at this oil-based clay stage and I end up explaining the entire sculpting and lost wax process from original clay sculpture to final bronze. This year I was savvy enough to bring more “visual aids” for each step to prompt interchange about each stage including armatures, other works in process, molds, wax versions and finished bronzes. It was cool to be able to point to the clay version and then the finished bronze and say “This is going to become That”! My favorite Art Attack interchange this year was with a 6 year old girl who quite intently asked about each stage… she called her Mother over and proceeded to explain my process as follows, pointing to each stage: “Mom!!! She works in oil-based clay, then Da-Dah, Da-Dah, Da-Dah, Da-Dah!! !” at which point she grinned hugely, giggled contagiously, threw her arms around my neck and gave me a big hug… Made my day!!! It is so true that the “sharer” often gets as much or more out of sharing than the “sharee”. Hopefully, my sharing inspired this young lady and many others to nurture their own creativity in this crazy hectic world!